The music CD of ‘Making the Cut’ songwriting contest winners will be released on August 5th, 2017 and there will be a concert of the songs given the same day. More details on the concert event page. Also, you can send us feedback about this CD or the contest. 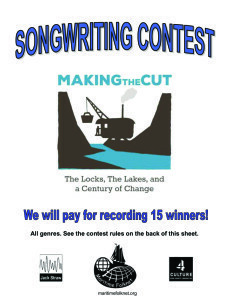 We are pleased to announce the winners of the ‘Making the Cut’ songwriting contest. All of the entries were fantastic, but we have a limited amount of space on the CD. I do not envy the judges their job at all! A huge thank you to everyone that entered and congratulations to the winners. You can enjoy some of the contest winners at Folklife this year, and also at our CD release concert in July. 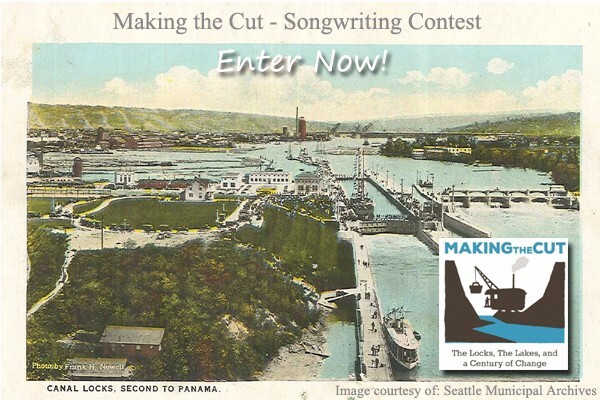 Entries for the ‘Making the Cut’ Songwriting Contest have been received and acknowledged. If you did not receive an email confirming that your entry was received, please send an email immediately to walice1@qwest.net , or phone 206-448-0707. The deadline to enter this contest is now passed. All entries have been received and will be evaluated by a panel of judges. The winners will be announced in late March or early April. A CD of the final recordings is scheduled to be released in time for the Boat Parade on July 9, 2017, when the public can hear live performances from some of the winners and finalists. Some of the finalists will perform live on February 19 at, ‘Presidents Day at the Locks’. Songs make history come alive. In the hundred years since they were constructed, the Lake Washington Ship Canal and Ballard locks have made changes for the people of King County, both positive and negative. The effects were widespread, changing the landscape and lakes. Populations and industry shifted. There are many vivid images and dramatic events that would make good song material. Maritime Folknet have created this song contest, to give song writers the unique opportunity to write a song about Lake Washington Ship Canal and Ballard locks, and record it for posterity. Your song can be about historical events, or about the effects on people and places down to the present day. All genres of music are encouraged: folk, rock, rap, blues, alternative, or whatever. Sometimes the most effective and memorable songs are short and simple. We would like to collect songs in a wide variety of genres, documenting the experiences of many different population groups. To assist songwriters in getting historical information, the project director (Contact: Alice Winship) will help you communicate with heritage organizations to get information on your song topic. The top fifteen winning songs will be professionally recorded. Each winner will get eight hours of free recording time at Jack Straw Cultural Center thanks to a grant to Maritime Folknet from King County 4Culture. Contestants must send a recording of themselves (mp3 format or audio CD only) performing their song to Maritime Folknet. They must also include a lyric sheet. All songs must have original lyrics and melody by the contestant(s). Songs may have been previously recorded. The writer(s) must retain all rights to the song. Entries must be received by mail or email by January 9, 2017. The winners will be chosen by a panel of judges. All decisions of the judging panel are final. Judging criteria includes song quality, applicability to the contest topic, historical significance, the way that the song represents the community, musical value, and literary quality of the lyrics. The top 15 songs will be professionally recorded and mastered by Jack Straw Cultural Center. Each winner will be allowed eight hours of recording time plus mastering. If a winner wants to use more studio time for the song, they can buy additional time from Jack Straw. The songwriters will retain all rights to their songs, with permission for Maritime Folknet to use the songs for this project without charge, and permission for the songs to be used for educational and non-profit purposes in perpetuity. 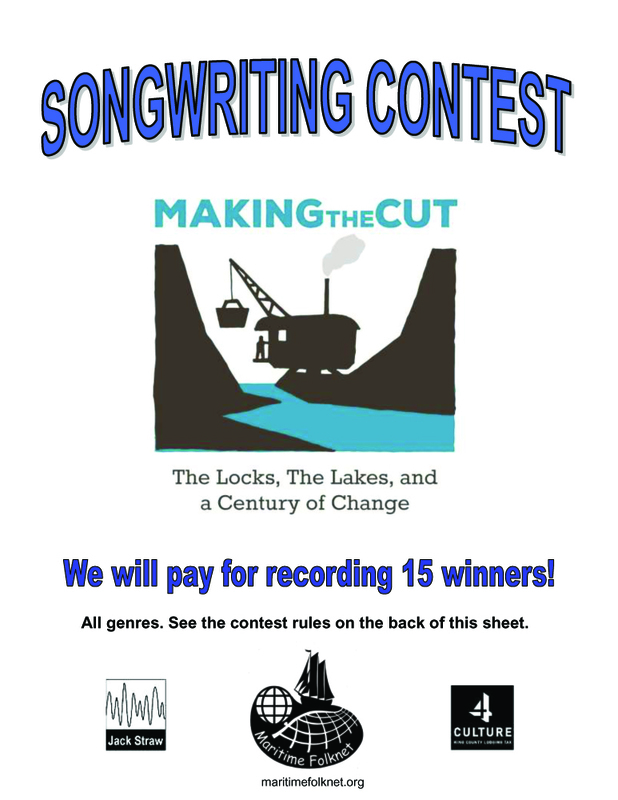 The runner-up songwriters will have an opportunity to submit a video that they recorded themselves, for free viewing of their song on the Maritime Folknet web site via a link to YouTube. The winning songwriters will receive one free CD, and will be able to purchase CDs at a discounted price, and can resell them to help support their musical efforts. Maritime Folknet will offer CDs and downloads for sale online at the CD Baby website. Maritime Folknet will distribute the songs at no charge to King County libraries and heritage organizations. This provides public benefit as required by the generous grant from King County 4Culture. Please include your name, email address and phone number.